The stunning bi-color flowers of Hot Lips Salvia are surpassed only by the rugged nature of the plant itself. Growing to 2 or 3 feet, this salvia makes a good choice for smaller gardens. As you can see by the stem on the right it can be a little hard to describe the flower color. Individual flowers can range from pink to white with a variety of combinations of these colors or single colors appearing throughout the plant. Sometimes we think there are more solid red flowers in the spring and then sometimes it seems like there are more in the summer. As yet, no distinct pattern of when to expect more bi-color flowers than solid flowers has emerged. 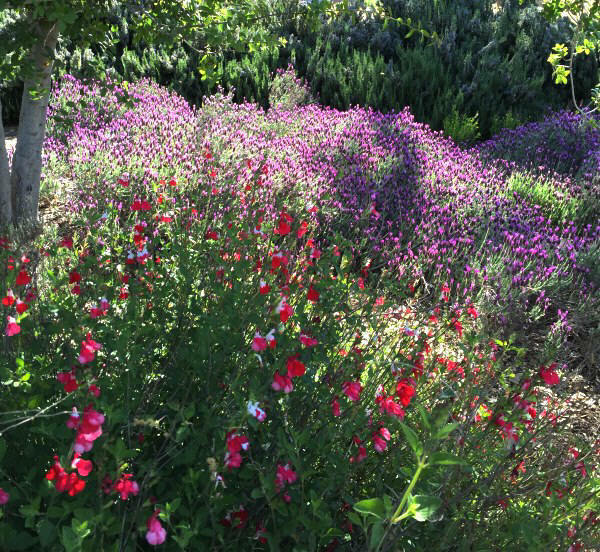 Look how beautiful this Hot Lips Salvia is blooming in spring against a river of blooming Spanish Lavender with dark green Rosemary as a hedge in the background. Hot Lips Salvia is a hummingbird favorite and a garden show piece. 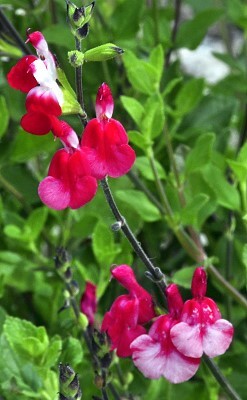 Hot Lips Salvia is included in our Wildlife Herb Garden Six Pack. This plant is often available in plug trays. These trays hold 128 of all the same plant. They are a great low cost way to fill a lot of space. Each cell is 3/4 of inch by an inch. 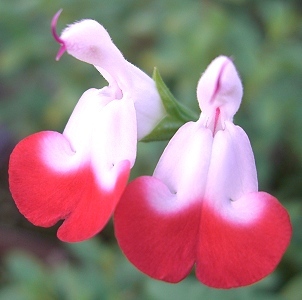 Check here to see if Hot Lips Salvia Plug Trays are available.